Our paper mache Day Of The Dead skeletons are created and painted by hand by folk artists in Mexico. 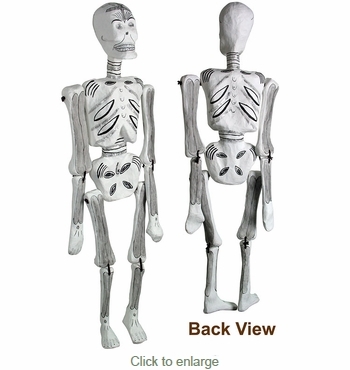 Both front and back of these paper mache skeletons are decoratively painted. The joints of the skeleton are attached with string so you can pose your skeleton in many lively ways. They're perfect for your Dia de los Muertos celebration. These are the same authentic Day of the Dead skeletons that are used throughout Mexico.